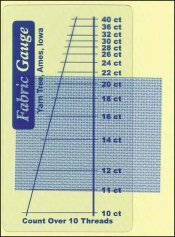 Fabric Gauge. Fabric Gauge  - $2.50 : Yarn Tree, Your wholesale source for cross stitch supplies. Item 3679. Fabric Gauge. Quickly find the thread count of any fabric up to 40ct by using this gauge and counting over 10 threads. Durable clear vinyl. Business card size–easy to carry with you for quick reference. From Yarn Tree. Made in the USA.